Another advertising expert says that pro sports offer an opportunity for Canada’s big banks to flex their financial muscles. “They’re really trying to do what some of the small fintech companies can’t do, which is own big things and look big, and look strong, and look safe,” John Yorke, president of Toronto-based strategy and digital marketing agency Rain43, told BNN Bloomberg in an interview. Yorke agrees with Cooper that deploying that capital on teams and arenas makes a more meaningful impact on potential customers. Brian Cooper, president and CEO of MTKG Canada and former vice president of MLSE, joins BNN to provide insight on the $800-million MLSE-Scotiabank deal. Bank of Nova Scotia has branded itself as “the bank of hockey” and has one of the nation’s largest footprints in professional sports, but that has not stopped Canada’s other majors from partnering up. Toronto-Dominion Bank recently announced new “official banking partner” deals with the Toronto Blue Jays and the Vancouver Canucks. 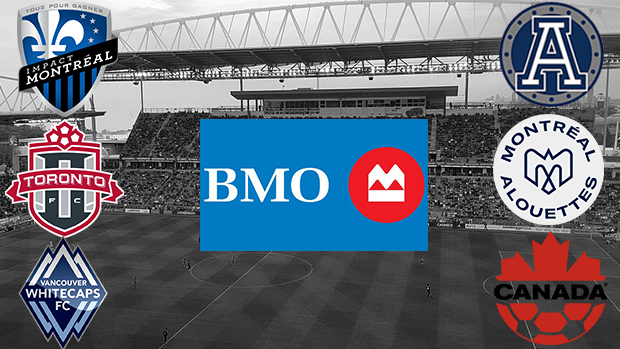 Meanwhile, Bank of Montreal has shifted its focus to soccer, partnering with Canada’s Major League Soccer franchises and getting its name on Toronto’s soccer stadium, BMO Field. 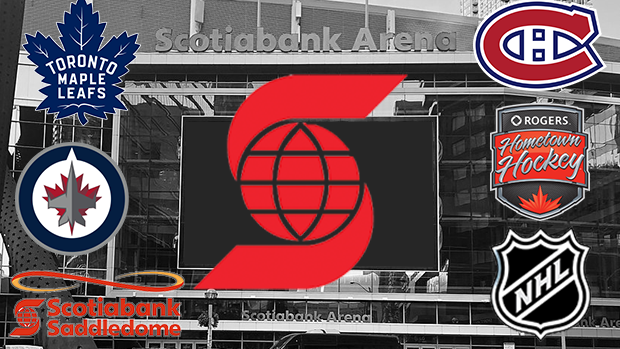 Cooper – whose MKTG lists Scotiabank as a client – helped bring together one of the biggest spends by a Canadian bank in recent years: The 20-year deal to rebrand Toronto’s Air Canada Centre as Scotiabank Arena, struck for a reported $800 million in 2017. He says the competition to win that contract was fierce among Canada’s financial institutions. 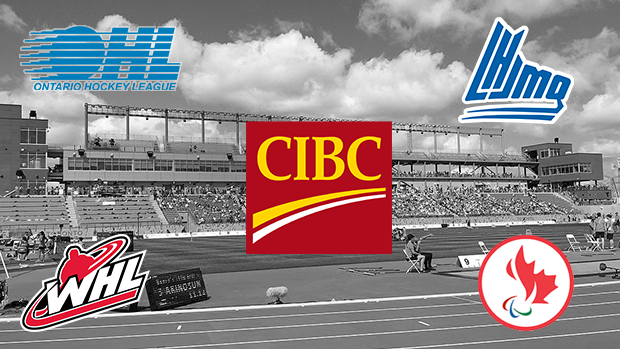 Here’s a look at some of the partnerships and sponsorship strategies for Canada’s major banks. Notable sponsorship deals: Naming rights to BMO Field in Toronto; sponsor of the Calgary Stampede; the Canadian Football League’s Montreal Alouettes and Toronto Argonauts (who play out of BMO Field); MLS’s Montreal Impact, Toronto FC, Vancouver Whitecaps and the Canadian Soccer Association; U.S. pro franchises in the Midwest including the NHL’s Chicago Blackhawks, Minnesota Wild and St. Louis Blues, and the NBA’s Milwaukee Bucks, Chicago Bulls. Cooper says: “It’s the pyramid of [soccer]. They’ve got kids community programs across the country where they’re sponsoring kids’ teams at entry level. Then they’re sponsoring the Canadian Soccer Association. Then they’re sponsoring TFC and they’ve got their name on the field and the jerseys. It is that full pyramid and at the top you have broadcast and the professional teams and the building, and [at the bottom] is the community programs. Notable sponsorship deals: Banking partner for junior hockey, including the CHL and its members, the Ontario, Western, and Quebec Major Junior leagues; associate sponsor of the MasterCard Memorial Cup; Canadian Paralympics. 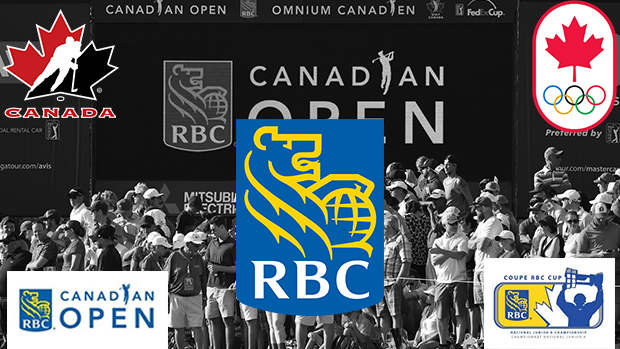 Notable sponsorship deals: Hockey Canada, Canadian Olympic Committee, Special Olympics Canada, the Right to Play foundation, RBC Cup, RBC Canadian Open. Notable sponsorship deals: Naming rights to Scotiabank Arena, Toronto and Scotiabank Saddledome in Calgary; sponsor of CBC/Rogers Hometown Hockey and Hockey Day in Canada; official bank of the Calgary Flames, Edmonton Oilers, Montreal Canadiens, Toronto Maple Leafs, Winnipeg Jets and the NHL. 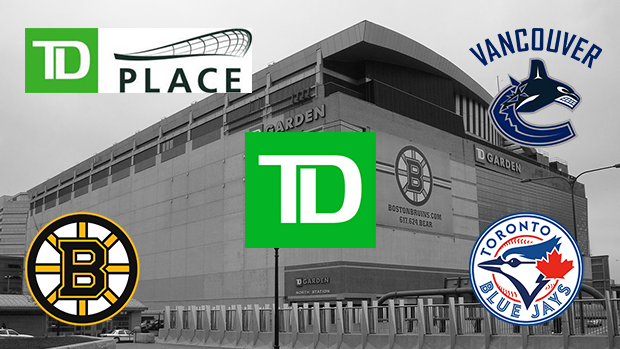 Notable sponsorship deals: Naming rights to TD Garden in Boston; sponsorship of Boston Bruins and the Celtics; naming rights to the TD Place complex in Ottawa, which houses an arena and stadium (and is home of the Redblacks, 67s and more); official bank of the Toronto Blue Jays; official bank of the Vancouver Canucks.